Uzbekistan, one of the Central Asian States lies in the heart of Asia, in the territory known since ancient times as Bactria, Maverannahr, and later on as Turkestan. Since ancient times, the geopolitical location of Uzbekistan has been where the main caravan roads traversed to link Asia and Europe, predicting the historical richness of the land. The country is situated in the middle of Central Asia between the Amu-Darya and Syr-Darya rivers. The highest point is 4,643 m. The country has a land area of approximately 447,400 square km and total population approximately 26 million, with a growth rate of about 2 %, the percentage of population in urban areas is 37.3% and in rural areas 62.7%. Uzbekistan has a rich history. In the 14th century, Uzbek nomadic tribes invaded from the north, conquering the small feudal states of Timurids and formed their own state. In the second half of the 19th century, the Bukhara, Khiva and Kokand khanates were joined to the Russian Empire. The Russian Revolution in 1917 changed the political situation in Turkestan and in 1922 Uzbekistan became one of the republics of the USSR. Uzbekistan announced its independence on September 1, 1991. The basic legal foundation is the Constitution adopted on December 8, 1992. The executive body is the president who is the head of State and of Government. On April 4, 2002 a Constitutional Law formed the new Uzbek parliament “Oliy Majlis” consisting of two chambers – Legislative chamber (lower chamber) and a Senate (upper chamber). The administrative structure of the Republic of Uzbekistan consists of the Republic of Karakalpakstan, 13 provinces, including Tashkent City, with 162 districts and 120 towns. In pre-soviet Central Asia, the many land tenure variations followed Islamic law and local traditions. The Khan or Emir owned all undeveloped land and the public land that was administered locally. At that time local rules (Adat) and Islamic law (Shariat) regulated land tenure. Whoever started to utilise undeveloped land on continuous basis became its owner. The land was transferable and subject to tax depending on its nature. Private lands were inheritable to all sons and therefore over times land holdings became fragmented. After the 1917 revolution, all previous laws were abolished and the all territory of Uzbekistan obeyed the laws of the USSR. Land was nationalised and new agricultural collective farms (sovkhozes and kolkhozes) were established. The first property inventory and registration organization, which was named the Bureau of Technical Inventory (BTI), was established 70 years ago. The first archive materials in Tashkent date back to 1930’s. The task was to make an inventory and register ownership rights only to buildings and structures. This was due to the situation that the State owned practically all the land in the country. After gaining independence, by the Resolution of the Cabinet of Ministers of the Republic of Uzbekistan from 31.01.1996 № 44, there was organized a special state cadastral authority called “Uzgeodescadastre”. There are more than 180 cadastral services subordinated to Uzgeodescadastre and located in each province and district. The Uzbek land registration administration consists of two Government organisations: State Committee of Land Resources (Goscomzem) and Main Administration of Geodesy, Cartography and State Cadastre at the Cabinet of Ministers (Uzgeodescadastre). Uzgeodescadastre is responsible for cadastre and registration of lands in urban areas and also (through the incorporation of the BTI services) for the registration of rights to buildings and constructions. Mainly, cadastral surveys are produced by the state cadastral services. At the same time legislation allows realisation of geodetic, cartographic and cadastral works by private juridical and physical persons. The main private sector is in the property valuation area. Real property rights registration and conducting of cadastre are only realised by state agencies. As a whole, there is tendency in the country to widening of private sector participation in cadastral works. There are two professional organisations concerned with cadastral activity. Geodetic Society of Uzbekistan (UzGS) was created in the year 2000, when the Astronomy-Geodetic Society of Uzbekistan was split into two organisations. The members of this society are both juridical persons as well as physical ones, like the specialists in geodesy, cartography, cadastre and land surveying who work in different agencies and in private companies. The main objective of UzGS is to assist the specialists’ professional activity. UzGS counts about 500 members and has branches in 3 regions. UzGS is going to apply for membership in the International Federation of Surveyors (FIG). The Valuator’s Association of Uzbekistan (UzVA), which has created in 1999, unites juridical persons and specialists-valuators who work in the state as well in the private sector. UzVA counts about 200 members and has branches in some regions. The main objective of UzVA is assistance to the professional activity of specialists, who practice in valuation of different types of property and property rights valuation. Cadastral works are not liable to licensing. At the same time, in according with legislation, geodetic, cartographic, valuation activities are liable to licensing, it means that cadastral surveys demand licensing. Licenses for geodetic and cartographic activity are granted by Government and licenses for valuation work are granted by the State Property Committee. Licenses are granted to juridical and physical persons for five years, taking into consideration the educational basis, experience of work and also material support. Surveying programs are offered at three institutes, two in Tashkent and one in Samarkand, as a 4-year bachelor degree of land cadastre, land surveying, geographical information systems, geodesy and cartography. The main institute, which provides land surveying and land cadastre programs is the Tashkent Institute of Engineers of Irrigation and Agricultural Mechanization (TIEIAM). The basic degree is the bachelors' degree. The yearly intake is 130 students and a total of 5,000 have graduated until this year. A Master's program was started recently both in land surveying and land cadastre and in geodesy and cartography. In addition, the Tashkent Technical School for Geodesy and Cartography (TTSGC), which is a school on college level cadastre, geodesy, cartography, economy and land law. The curriculum consists of three or four year studies depending of the length of their earlier school education. The four-year program includes 700 hours of practise. A geo-information system which combines legal, fiscal and other information about property, necessary for the management, planning and support of decision-making for many purposes (multi-purpose cadastral system). According to the Law “About State Cadastres”, there are about 20 cadastres being created in Uzbekistan: land cadastre, cadastre of buildings and constructions, water cadastre, forest cadastre, cadastre of mineral resources and more. The basic cadastre is the land cadastre, which realises the functions of recording, valuation and land plots rights registration. At the same time, the multi-purpose cadastre of the territory is created by Uzgeodescadastre. This means a geo-information system named the Uniform System of State Cadastres (USSC). “State land cadastre is the main component of the Uniform System of State Cadastres and in a system of information and documents on natural, economic, legal type of lands, their categories, quality characteristics and value, location and size of land parcels, distribution of them among owners, possessors and users. Ownership and other rights to land plots, easements, limitations, transferring and cessation of rights are liable for registration. Registration of rights to buildings and constructions are realised in the cadastre of building and constructions. The cadastre of building and constructions together with land cadastre form real property cadastre system. Textual Component - state land register (book) identifying real property parcels, which includes all land parcels and owners' rights and restrictions of rights, such as ownership, easements, mortgages etc. Spatial Component – the cadastral maps show all land parcels graphically corresponding to the registered title with plan numbers and unique identifiers. These are all now digitized. Cadastral maps consist of surveyed and not surveyed (for example natural) boundaries. 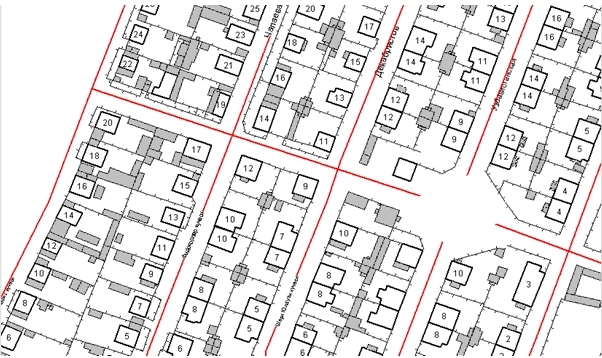 Most surveyed parcel boundaries have been determined by cadastral surveys such as subdivision etc. Rights to buildings and constructions are registered in a separate register – cadastral book of building and constructions. Since the year 2002 in 3 regions of country a computer real property rights registration has began as an experiment. At the same time the cadastral information systems` database is started to be created on local as well as on central level. These systems include not only registration, but also other additional information about property objects. There are some types of land-cadastral maps, which serve as representation of different land resources characteristics and the characters of land using. For the purpose of land plots rights registration, there are special index cadastral maps (plans), which are made in the same coordinate system and nomenclature as the topographic maps (plans). The scales for index maps are: for rural areas 1: 5000, 1: 10000; for urban areas 1: 500, 1: 2000. The basic context of the index map (plan) is: boundaries of land plots, cadastral numbers, main buildings, roads, water objects, boundaries of easements, streets` names and more. The information on the index map is put in only after registration of rights to the land plot in the land register. Cadastral index maps (plans) are conducted as traditional hard copies, but starting the year 2000, digital index maps (plans) are being created and conducted in some regions. Below is an example of digital cadastral index map of Chirchik town (Tashkent area). As said before, multi-purpose geo-information systems are being created in Uzbekistan; base layer of such a system is the land cadastre with data from land plots with unique cadastral numbers. The core data sets of the SDI are organized in layers which include: Geodetic Network, Administrative Boundaries, Cadastral Framework, Topographic Coverage, Road Network, Address System and Geographical Nomenclature. Gradually, additional data sets are being integrated through collecting and contribution of different agencies. These databases include features of Soils Type, Vegetation, Minerals, Fauna Distribution, Hydrography, Historical Monuments, Real property and so on. The cadastral information is also providing accessibility to land information from other sources involved in land and utilities management and spatial analysis. The Uniform System of State Cadastre is becoming increasingly significant in a wide range of social, environmental and economic activities. It should be noted, that the term “Cadastre” has been used only by specialists until recently, but now almost all of layers of population are forced to use and talk about cadastral and real property registration matters. Accordingly, the quantity of registration transactions growths more and more as real property is being involved into the market. Distribution of functions of the state real property rights registration between three differential agencies (fig. 2). Separate registration complicates the forming of uniform state real property rights register and information cadastral system in total. It also creates complications for using of information, which has to address to different services. During this year the situation has improved with the incorporation of BTI into the Uzgeodescadastre umbrella. Material of residential buildings and its location land plots inventory has been created over 70 years’ time by the Bureau of Technical Inventory without surveying of boundaries. This does not give the possibility of its entering into the land cadastre without additional measurements and cadastral survey. Accordingly, new cadastral surveys of land plots with residential buildings will demand additional time and funds for its realization. Regarding transferring to computer technology and cadastral maps, it is necessary to decide on the problems of development and entering to the computer system of earlier information (registration, technical, economic and etc.). Also there are problems of digital cartography base’s creating and creating of its interface with the textual data base, not to mention the problem of a massive training of staff. When integrating in a uniform computer registration system, different agencies and institutions will supply necessary information for the system. Besides, the Government is considering the possibility of necessary institutional reforms for solving the matter. On the first stage of creating the computer information system, it has the possibility of using foreign experience in the project, for example with support of European Union and other international organizations. The development work for this system has already started.